The Fabric of the Neighbourhood: How Does it Empower You? Living a happy and fruitful life does not quite stand alone. What matters most is where you are living, by who are you surrounded by and what beneficiaries can you reap from your nearby. 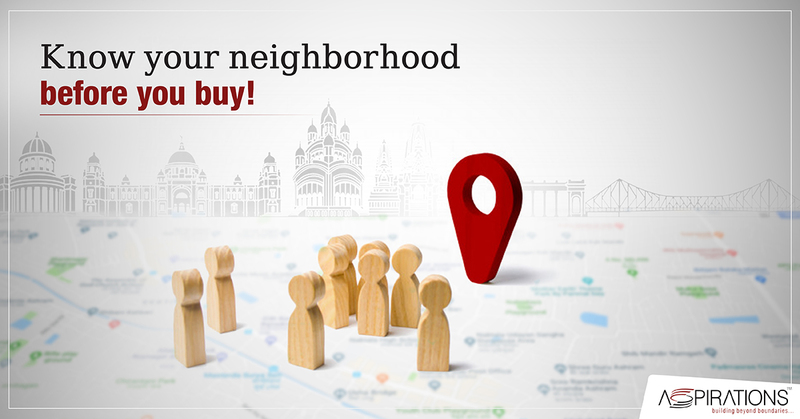 Aspirations promise you a good neighbourhood that will empower your dream to stay in one of its best residential projects in Kolkata. The social circle with its human touch comes into foreplay. What man desires is always a better community living. A helping hand during an emergency is the most humane thing to expect. Aspirations 4 BHK flats for sale in Kolkata are located in the prime areas of higher capital growth and places with deep ethnic roots. Residing in such homes will eventually help in your business networking and enhance your cultural engagements. Good neighbours are psychological healers. The best residential projects in Kolkata must have necessary appendages. A quality choice of schools and colleges often drives potential buyers in any prime location. Aspirations projects in South Kolkata and North Kolkata promises you with maximum educational benefits. Putting your child into one of the best institutions without the hassle of long journeys is what every parent dreams of. Dreams are further empowered with financial support. Living within the proximity of your work culture is again a feeling of empowerment. Rajarhat is now a technological hub beaming with world-class technocrats. Aspirations new flats for sale in Rajarhat are located within the IT (Information Technology) vicinity, well connected to Salt Lake and Newtown being the other technological hubs. Connectivity again becomes the primary concern. Aspirations Grandeur, premium flats for sale in South Kolkata, are located off Sarat Bose Road, at a distance of a few minutes’ drives from Minto Park, Gariahat, Hazra Crossing and Quest Mall. On the other hand, Aspirations Elegance, Azalea and Orchid are intersected by Hazra Road, Lake Road and Rash Behari Avenue. The Southern fringes are again connected with Kolkata Metro services and with Sealdah with important roads for the fastest transportation. The self remains half fulfilled without a life of entertainment. Planning for a Sunday brunch yet your favourite café seems quite far away is always disappointing. The premium residential projects have its nearest proximities to well-known restaurants, pubs, theatre halls, multiplexes, malls like Quest Mall and clubs. You will always get the scope of replacing out fatigue with rejuvenation. Aspiring a good neighbourhood is the key to healthy living. Venture out and explore the meaning of life with Aspirations residential projects.